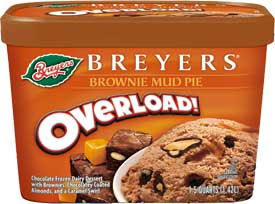 Breyer's Brownie Mud Pie OVERLOAD! Cracking open the container of Breyer's Brownie Mud Pie was ironic in a couple of ways last night. First, I was struck by the fact that even though I had been home for 2 hours, the container was still quite 'muddy', in other words, still quite soft. The other irony was the fact that I had just written about eating smushy ice cream, and here I am, presented with an entire container of it. Anyway, Brownie Mud Pie falls into the Overload! series, which are not only overloaded, but also try to steer towards a healthier dessert. Usually they use light ice cream, but in this case, they use a "Chocolate frozen dairy dessert with brownies, chocolaty coated almonds and a caramel swirl". Why don't they classify this as a light ice cream? Must have something to do with how they make it, just weird since the ingredients are the same as their light ice creams. Can I tell the difference? if it wasn't half melted, maybe I could, but we'll know for sure on a second scoop review. Overall, a fine treat for a palate that was in dire need of some chocolate. The brownie pieces are plentiful and tasty. The almonds are in there somewhere. The caramel swirl is ok, though I don't know if it's really needed. Now that I think about it, I haven't bought a good brownie infused ice cream in a while, and this one fits the bill just fine! On Second Scoop: still tasty ...still melting like nobody's business, must be the manufacturing process, kinda strange. 2011 Update: Mud Pie did not make the transistion to a Breyers BLASTS! flavor. This is one of my favorite ice creams, in my top 2!